€19.60 Including delivery within Ireland, North and South. 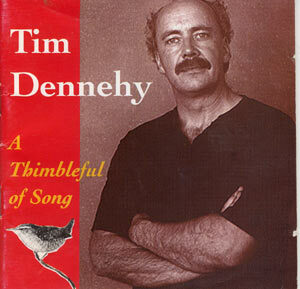 Tim Dennehy was born in Ballinskelligs and, later, the family moved to nearby Caherciveen. He spent a number of years working in Dublin and now lives with his wife Máirin and their sons Tadhg and Seán in Mullach, Co. Clare. He is essentially a Kerryman. This is reflected in the songs on this album. The Clare influence is there ('Faha Sports', 'Mac and Shanahan', 'Keep in Touch'), but the overall thrust is firmly rooted in his native town and county. Sigerson Clifford, Daniel O'Connell, Tomás Rua Ó Súilleabháin, Brendan Kennelly - word-weavers all, and Tim himself continues this tradition in the songs he makes and sings so evocatively. These songs have indeed a keen sense of place. Simple and hauntingly poetic, emotive and thoughtful - in a word, rural. The themes are varied - separated and abandoned lovers ('Keep in Touch', 'Once I Loved'), victims of Black and Tan terrorism ('Mac and Shanahan'), sanctuary from the throng on an offshore Atlantic island ('Sceilig Mhichíl'). Catholic Emancipation is treated in the strongly worded political ballad 'Dónall Binn'. Tim's deep love for the Irish tongue and an intensely personal spirituality ('Amhrán na Páise') are evidence that he has never lost touch with the rich tradition which he has inherited. His hypnotic rendering of Sigerson Clifford's magnificent 'The Ballad of the Tinker's Daughter', the air to which he composed himself, is truly mesmerising. The title of this album is taken from another of Clifford's wonderful poems 'The Ballad of the Tinker's Son'. He acknowledges his debt to this great poet with a fine song dedicated to his memory ('Sigerson'). On a lighter note we hear of the wild shenanigans at the Faha Sports (the floor was specially treated, so watch your step!!) or the wry Dublin wit of Brendan Phelan's 'Paddy's Walk to China'. Whatever the theme, Tim's enthralling voice and poignant singing style show a deep sincerity and an innate ability to capture mood which immerse the listener in the soulful images he creates. Beir bua, Tim, agus gura fada buan ceolmhar tú.